The frames of North Eton No.2 in storage at Kallangur on 12 April 2003, surrounded by a jumble of treasure and trash. The loco’s rear frame & buffer plate / dragbox has been removed, presumably due to wastage. The surrounding items include some ornate cast-iron columns hiding among various manufacturing scrap & offcuts. This locomotive was No.2 on the roster of the North Eton Mill, near Mackay, where it was known as ‘Septimus’. It was originally supplied by Hudswell Clarke & Co as a 0-4-2ST but converted in 1930 to 0-6-0ST via modification to the rear frames; evidence is seen in the side rods which have an unusually long reach to the rear axle, which was presumably situated behind the firebox. 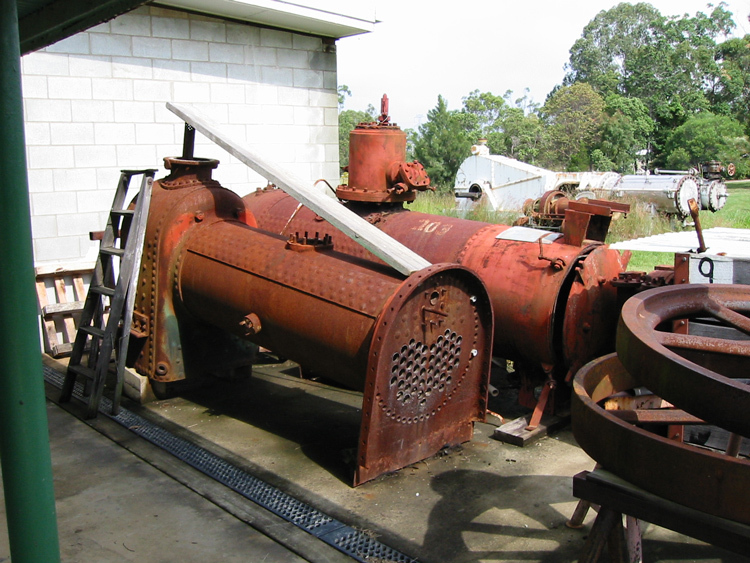 North Eton Mill No.2 was initially preserved in 1970 at the Pioneers Transport Museum, Nambour, moving to the Seal Park Zoo & Museum, Tanawha in 1973. Around 1986 it was acquired by a collector and moved to his industrial premises at Kallangur / Murrumba Downs, north of Brisbane. The owner kindly showed me his collection at Kallangur on 12 April 2003 and the photos on this page date from that visit. North Eton Mills No.2 was found dismantled with the frames, boiler and saddle tank stored around the site. The saddle tank was heavily corroded but was being retained as a template for a replacement. 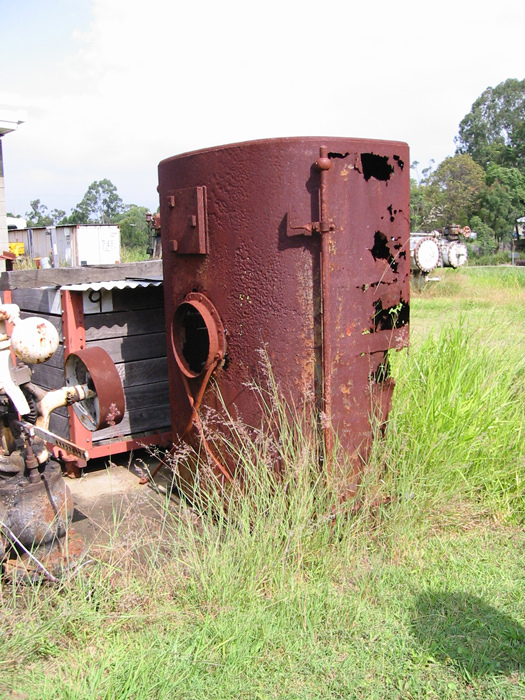 The industrial premises at Kallangur / Murrumba Downs were sold for redevelopment around 2007, with North Eton Mill No.2 and most other steam relics at the site transferred to a new business location in Narangba. Alas the owner has since passed away. Internet newsgroup posts in November 2018 suggest the locomotive has now changed hands; further information is welcome. The photographs on this page don’t give a good view of how North Eton Mill No.2 looked when in service, but presumably it was similar to sister 0-6-0ST North Eton Mill No.1 (Hudswell Clarke B/N 496 of 1898). I would appreciate the contribution of further information or photographs for North Eton Mill No.2, either during its service career or during its later preservation era moves. As an aside, the namesake North Eton Mill closed in 1988 after 100 years of operation, following merger with Farleigh, Racecourse, Marian and Cattle Creek Mills to form the Mackay Sugar Co-operative Association Limited. Glen Hall provides a good history of the North Eton Mill on his Mackay History website. An excellent source of information on the various Hudswell Clarke steam locomotives employed by the Colonial Sugar Refining Co Ltd (CSR) in Australia and Fiji is ‘Salute to the Hudswells’ by Ian Stocks, David Mewes and John Browning. Page 132 of this book provides some history for this locomotive and other Hudswell Clarke products supplied to the non-CSR mills in Queensland. The boiler of North Eton Mill No.2 at Kallangur on 12 April 2003, with the boiler of Krauss ‘Dulce’ behind. It looks like the tubes had been recently been burned out, in preparation for boiler repair. The old saddle tank, being retained as a template for a replacement. 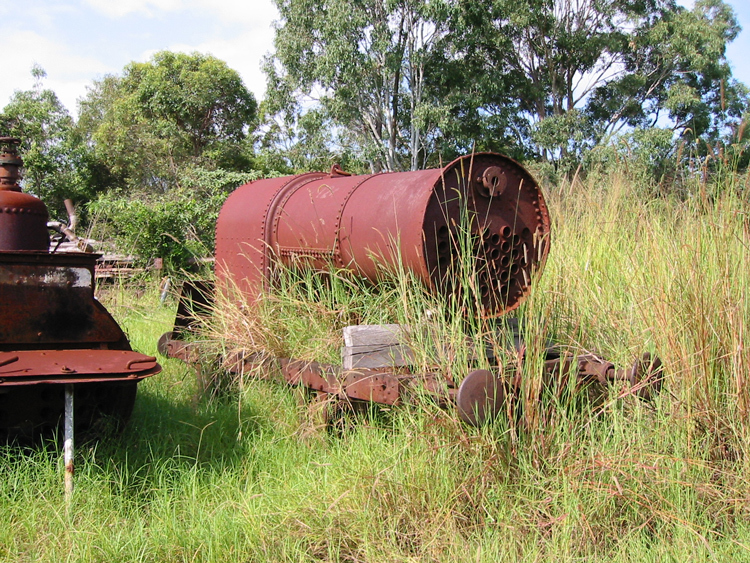 An example of the interesting items stored at Kallangur: a saturated boiler of unidentified origin, sitting on an ancient 4-wheel wagon frame. 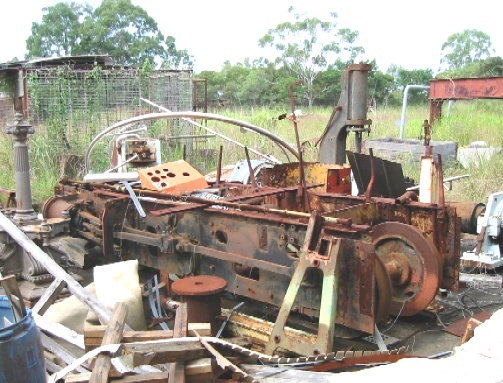 Published by Australian Narrow Gauge Railway Museum Society, 2014.